Shefali Balwani and Robert Verrijt will lecture at the Transfer Dialogues in Colombia GSAPP, New York, on Friday the 5th October. 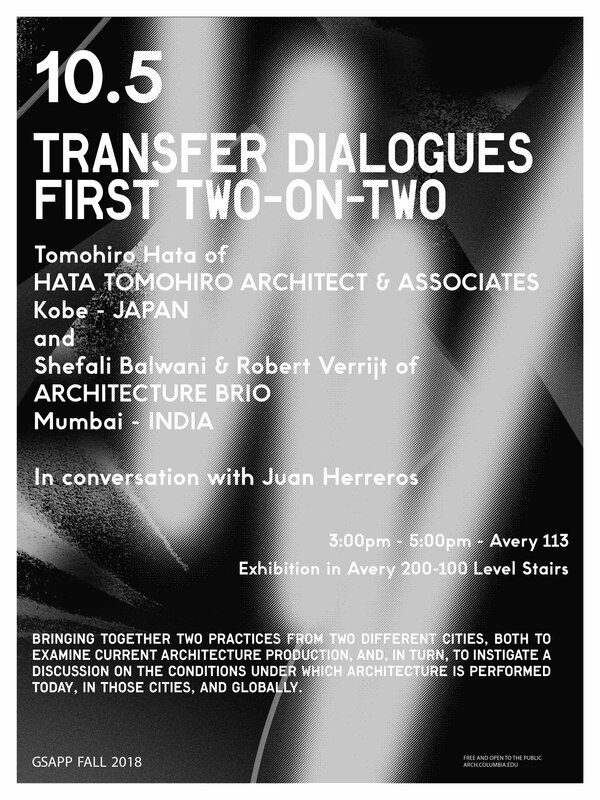 Alongside Tonohiro Hate from Tomohiro Hata and Associates, Kobe Japan, this lecture brings two different practices from different countries together. It explores and compares their way of producing architecture in today’s globalised context. As part of a series devoted to crossovers between architecture debates, this event speculates on the potential realignments and reformulations in contemporary architectural practice. Both practices examine current architectural production. This will instigate a discussion on the conditions under which architecture is performed today in Mumbai and Kobe as well as globally. They keep an emerging attitude involving different front lines of operation between the professional, teaching, publishing and speculating about architecture and its different facets. Responses are by David Benjamin and Juan Herreros.